Total Weight Gain: 30 lbs. Maternity Clothes: pants are only maternity. 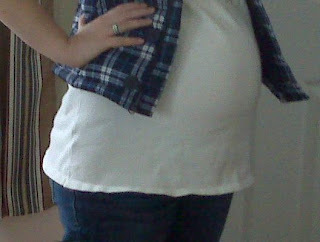 shirts are maternity for the most part except for some dresses that were kind of short pre-pregnancy. they make great tops now! Stretch Marks: still no stretch marks on the belly. Sleep: i slept very well this week. i've been very exhausted after work! Best Moment This Week: getting flowers from my husband! Movement: she's moving all of the time. 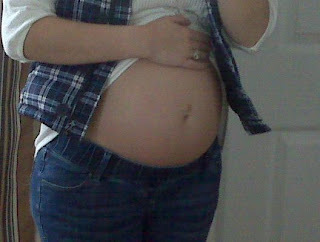 it's so crazy to look down at my belly and see it moving all over the place! Food Cravings: depends on the day! but i have been craving strawberries this week. Labor Signs: just false contractions... my uterus is getting into shape. Milestones: reaching week #31. we're almost to 8 months. 63 days to go! 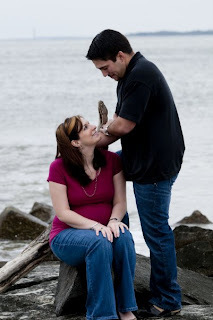 Today (while we're in South Carolina), Josh's sister had a friend meet us to take maternity pictures. He was going to take them back in November but there was a conflict so we were able to do it today. I'm glad we did them today because I am showing a lot more now than I was in November. It was sooooo cold and windy today! We went to Fort Moultrie on Sullivan's Island to take the pictures. It was such a beautiful place--despite the fact that it was overcast. The photographer, Josh, and I had a lot of creative ideas so I think we got some really good pictures. I can't wait to see them! We also went to Avatar today at the IMAX 3d theatre. It was a great movie but it was really long... almost 3 hours. Sitting upright that long about killed me! I was in so much pain... I closed my eyes at one point and fell asleep but when I woke up, I was able to get right back into the movie. I have never seen a theatre full of people so captivated by what was on the screen--no wonder it's been so successful! I would definitely recommend it... just not if you have a torn ligament in your abdomen! Sitting is no fun! Maternity Clothes: even my maternity shirts seem to be getting smaller on me... and to see at night, I wear Josh's t-shirts and PJ pants. Sleep: just depends... some nights this week I slept through the night but others I woke up ready to eat at 3am. Best Moment This Week: seeing Julianna on the ultrasound and finding out that she's doing wonderful! Movement: she's moving all of the time. Food Cravings: anything sour... whether it be fruit or candy... gimme! 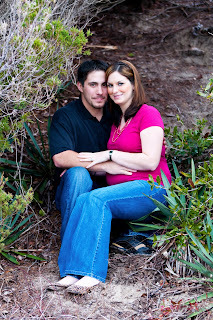 What I am Looking Forward to: seeing the maternity pictures that we took today. I went back yesterday for my follow up to see how the blood work turned out and to have an ultrasound to check on the baby. Did the usual when I got there--checked my weight (156) and I had to give a urine sample. Then, I had my ultrasound. 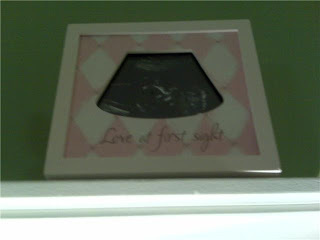 The baby is weighing in at 2 lbs. and 11 oz. 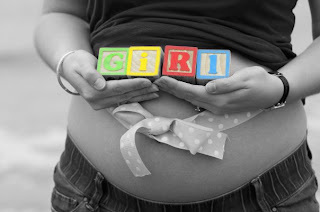 right now--which puts her in the 41th percentile for weight at her stage of development. She is breech and she has a big head. Her position and her big head are the cause of my torn ligament. Her head is pushing against an already sensitive area. The ultrasound technician said that torso was small and my uterus most likely tore the ligament in my upper abdominal area. Then Josh and I waited and waited and waited to see the doctor. Apparently, she was the only doctor there and had way too much going on. After over an hour, we got to see her. She looked over my blood work and everything was normal. The only thing that I was surprised about was that it showed that I've had mono within the last 6 months. I didn't even know that I had been exposed but I guess working in an elementary school--I could catch anything! The doctor was pleased with the baby's weight and growth as well as my weight, blood pressure, and my blood work. She examined me again and pretty much confirmed what the ultrasound technician said. The baby's position and the size of my torso are the problem. 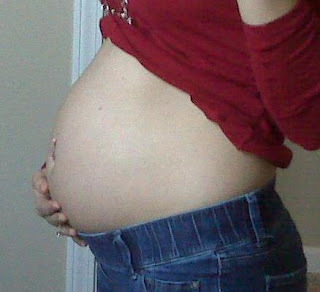 I was very small to start with so my belly has had to make adjustments to fit my growing uterus. Treatment? There is basically nothing I can do to make the pain go away completely--except when I deliver her! To cope, the doctor told me to take Tylenol, apply heat, and lay down as much as possible. 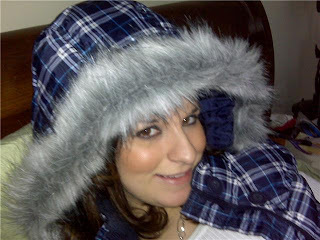 I feel relieved to know that Julianna is doing good and that my pain is not serious. I'm very thankful to know that there isn't something major wrong with me! 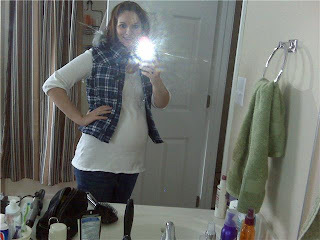 Maternity Clothes: that's pretty much all I can wear now except for a few longer tops that I have. 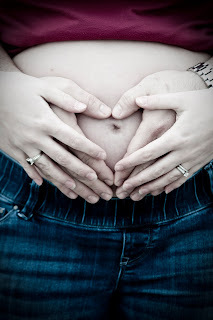 Best Moment This Week: finding out that the baby is doing great and that I will have another ultrasound on Thursday! Movement: she's moving like crazy! Food Cravings: banana pudding... I just had some from the Wal-Mart deli. Belly Button In or Out: still in. I took my belly button ring out this week. My belly button is so shallow now. What I am Looking Forward to: ultrasound on Thursday! Milestones: getting the nursey semi-complete is exciting! 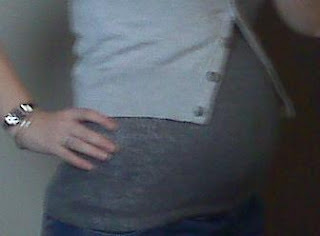 28 weeks. 4 days. doctor's appt. I just got home from the doctor to see what in the world is wrong with my side. When I first got there, the nurse weighed me (158 today... weight gain of 30 pounds), checked my temperature and blood pressure... and asked the usual questions. Then I waited and waited and waited in the exam room. It felt like forever! Finally, a nurse practitioner came in to evaluate me (since my doctor was not at the office today). She was VERY thorough. She checked the baby's heartbeat (147), examined me externally and internally, checked my heart and lungs, and asked me many questions. She made me feel as though she truly wanted to help me feel better--which is good feeling to have at the doctor's office! She seemed stumped. She had a few hypothesis' about what it could be but she wasn't sure about anything. I had three different blood tests done today and I will go back next Thursday for a follow-up and an ultrasound to check on Julianna. 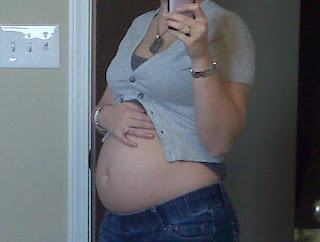 Her strongest belief was that my uterus has been growing and could have possibly caused a broken rib or torn ligament. I just hope it isn't anything more serious than that. I hope they are able to find out exactly what it is but most of all, I want my baby and I to be safe. So in the meantime, I am not allowed to lift anything that is more than 10 pounds and I am on partial bed rest, meaning that when I'm not at work, I need to be laying down and when I am at work, I need to rest as much as possible. She also prescribed some stronger pain medication to ease my pain for the time being. Keep me (or should I say, us) in your prayers! 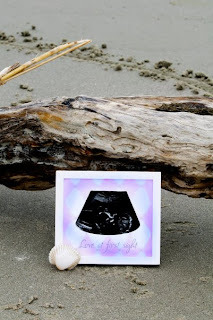 "I have been experiencing really strange feelings in my stomach since about 14 weeks. At my last appointment, I mentioned it to the doctor and she didn't seem too concerned but wanted me to let her know if it continued. In the past few weeks the strange feeling has changed to pain. Sometimes it feels unbearable but thankfully, I only experience it when I am sitting upright for extended periods of time... but sometimes it happens just after a few minutes. I let her know about again today and she still doesn't seem really worried. She thinks it may be the baby pushing against my stomach--especially since the pain has increased as the baby's size has increased or it could be a hernea. I won't be able to know for sure until I have the baby. I'm just praying the pain eases up! " Well, the pain hasn't gotten any better. In fact, I think it's worse. Before it was just painful when I was sitting upright but in the past few days, I have experienced the pain when I am standing and laying as well. At my last appointment the doctor didn't seem concerned but I am-- I'm in pain! I'm going to call the doctor's office first thing tomorrow and see if I can be seen. I want to be sure I'm ok and of course, little Julianna. If anything, I need something to ease my pain! Total Weight Gain: 26 lbs. 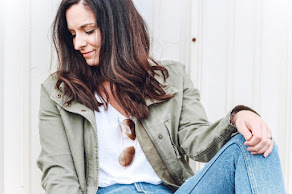 Maternity Clothes: Yes! 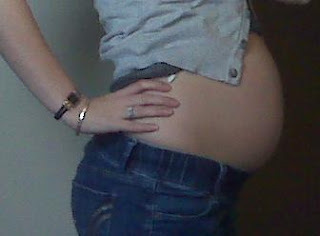 I have been in maternity pants since around 13 weeks. Now I can't wear many of my regular shirts so I've recently purchased a few more maternity shirts. My belly is exposed in my regular shirts! Stretch Marks: None on my belly but my chest stretched way too fast! Sleep: I'm always tired and ready for a nap. At night, I have been sleeping okay. I usually am either awoken by baby movement or hunger. Best Moment This Week: a waiter at Macaroni Grill notices that I was pregnant. Most people keep telling me that I don't even look pregnant so it's nice to have a stranger comment. Movement: I can feel her all of the time. Especially when I am laying still. 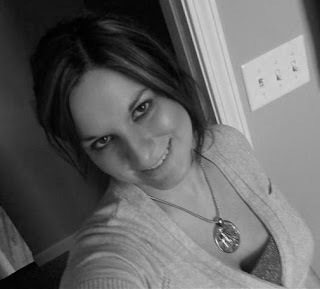 Food Cravings: I'm loving Granny Smith applesauce and no back chocolate peanut butter cookies. Labor Signs: I am beginning to have false contractions. I would like them to remain false! But they are freaking me out! Belly Button In or Out: It's in. I kept thinking it would pop anytime but it still hasn't. Guess we'll see what happens. 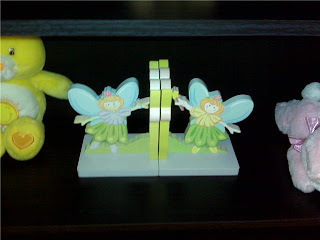 What I am Looking Forward to: My baby shower next month. Milestones: I've reached 7 months and the point where I have to go to the OB every 2 weeks. We are officially at the 7 month mark. Julianna is scheduled to be here in less than 3 months (83 days to be exact). 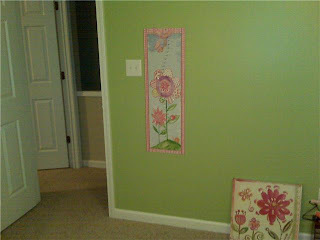 Here the is baby bump progression for this week: Today, Josh and I spent several hours working on the nursery. We went shopping at Home Goods last night so we had lots of stuff to do today. 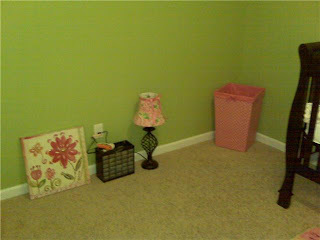 This is where the dresser/changer will go when we get it. 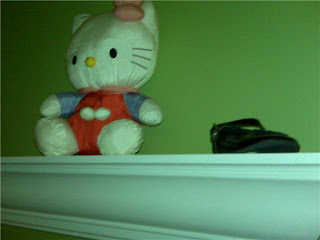 Hello Kitty and my baby shoe. Everything is coming together very nicely! 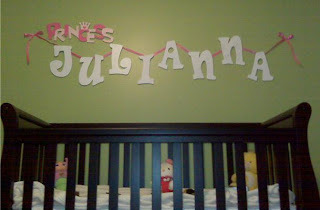 Yesterday, Josh and I worked on the nursery and got a few things done. 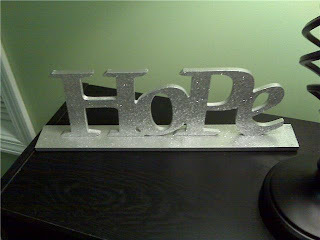 We finally have the letters for her name hung on the wall. We bought those letters the day we found out she was a girl... November 2. 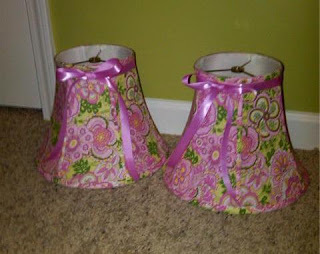 I also added the ribbon and bows to these Vera Bradley lampshades that I bought awhile back: The nursery is coming together! YAY! Today, I had a doctor's appointment. I have been experiencing really strange feelings in my stomach since about 14 weeks. At my last appointment, I mentioned it to the doctor and she didn't seem too concerned but wanted me to let her know if it continued. In the past few weeks the strange feeling has changed to pain. Sometimes it feels unbearable but thankfully, I only experience it when I am sitting upright for extended periods of time... but sometimes it happens just after a few minutes. I let her know about again today and she still doesn't seem really worried. She thinks it may be the baby pushing against my stomach--especially since the pain has increased as the baby's size has increased or it could be a hernea. I won't be able to know for sure until I have the baby. I'm just praying the pain eases up! Little Julianna had a great heartbeat today. It was 140-- which is about the same as it has been for the past few months. I have gained weight. Today I weighed 154, which is total pregnancy weight gain of 26 pounds. 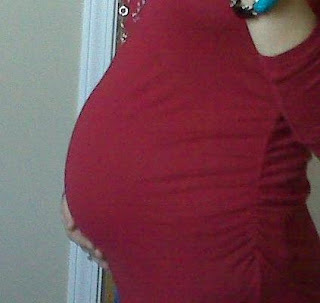 It blows my mind when people tell me I don't look pregnant. I feel like I'm the size of a cow! My blood pressure was also good today-- 110/70. Things are looking good! I also had my glucose tolerance test today. 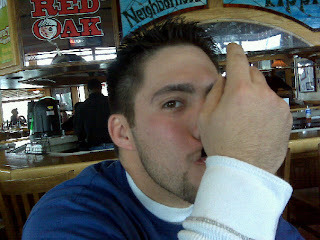 The drink wasn't as bad as everyone had said. Several women that I talked to told me that they could barely drink it and that it tasted really awful. But I found it to be just a really sweet orange soft drink. After an hour, they drew my blood and I passed the glucose test. I was definitely happy about that! It was a really busy appointment today because I also had to get my RhoGAM shot. My blood type is B negative so I had to get the RhoGAM shot 13 before my due date so that when I deliver the baby and I are safe because they do not want out blood to mix. The shot wasn't fun at all. I have never had a shot in my bottom and I hope I don't have to have another one anytime soon! I'm sore! Since I'm in the third trimester now, I will be visiting the doctor every 2 weeks for the next 8 weeks and then every week up until my due date. Hopefully the next visit won't be as busy! We tried their Dessert Shooters and they were soooo good! My favorite was the strawberry cheesecake. I have to have something sweet after every meal... pre-pregnancy and during pregnancy. I have been hungry non-stop lately. I guess Julianna is picking up the pace in the weigh gain department and wants more nourishment. I'm going to the doctor tomorrow for my glucose tolerance test and I also have to go back to work tomorrow. It's been a nice and relaxing Winter Break... I don't want to go back! More relaxation, please! 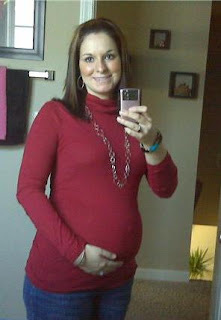 Happy New Year and Welcome to 3rd Trimester! 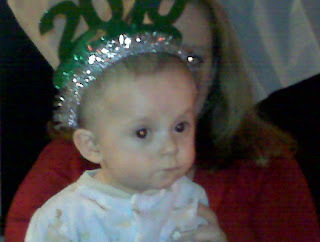 Dylan on New Years Eve: Happy New Year! This year is sure to be exciting. 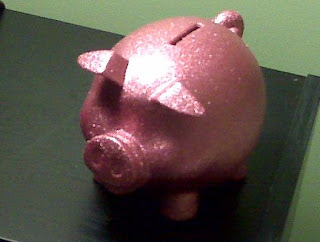 Our little girl will make her debut in 2010! YAY! 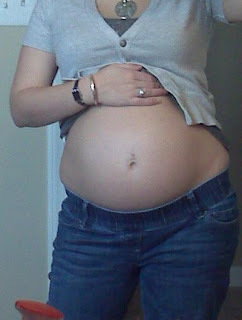 Today also marks my first day of third trimester. We are on the home stretch now! I go to the doctor on Monday to check her progress and to do my glucose tolerance test. I hope all is well!